The Important Stuff Homeowners need to Know Before Buying New Carpet! Expert Reveals: How to Choose New Carpet Wisely, Avoid Scams & Save Hundreds! Q. How Much Should I Spend on New Carpet? The Carpet & Pad prices below do not reflect how much it will cost to install your carpet. Carpet costs vary depending on what part of the country you live in; how difficult your project is; and what Carpet Style and Carpet Quality you select. Read this article to learn the secrets to choosing new carpet wisely! In a perfect world, the more you spend on new carpet, the higher the grade of carpet you will get and the more durable it will be. But one thing is for sure... If you spend too-little on new carpet, the quality will be low and the faster your carpet will wear out. 1. The level of foot-traffic you have in your home. 3. Take my free Carpet Foot- Traffic Test to begin. Learn more about choosing the Right Carpet Fiber for your needs, goals and budget. Learn more about choosing the Right Carpet Padding for your needs, goals and budget. Obviously, spending just $15 per yard on new carpet won't buy you top quality carpet. However, if you have low foot traffic, you still can enjoy many years of use from an inexpensive nylon carpet, providing you take proper care of it. On the other hand, if you buy a high quality nylon carpet and don't take proper care of it, it will certainly wear out much faster. Proper carpet care and maintenance can greatly help extend your carpet's lifespan. Visit my free Carpet Care Guide to learn how to make sure your carpet lasts as long as possible. Most homeowners experience some degree of "sticker shock" when they discover how much new carpet is going to cost. You might need to save up more money before you purchase new carpet or perhaps you might consider completing your new carpet project in two or more stages. However, you should never settle for a lesser-grade of carpet that cannot handle your level of foot traffic! If you don't plan on being in your home forever you might not want to spend a fortune buying the highest quality carpet right now. Most folks plan on having their carpet last for about 7 to 12 years. After that they plan on moving or changing the carpet to something different. If you have active children or teens or have pets that have frequent accidents then this must be taken into consideration. Kids and pets can be very hard on any grade of carpet. When our four children were young, they spilled lots of things on the family room carpet and it was very difficult to manage. To combat this common parenting problem, I replaced the family room carpet every other year. I purchased an inexpensive apartment-grade carpet to keep the costs down and installed a good-quality 8-pound Rebond padding so I didn't have to replace the pad every time I replaced the carpet. This saved us a ton of money over the years and we didn't have to worry about the kids ruining an expensive carpet. Best Carpet Fibers For Kids Bedrooms? Kids bedrooms tend do best with a low-cost polyester (or P.E.T. Polyester) carpet with a pile-height of less than half an inch. Polyester is naturally stain resistant and cleans rather easily for most common food stains. Unfortunately it is prone to matting and crushing of the pile so the lower the pile-height the better. Don't spend a lot of money on carpet for kids bedrooms. Best Carpet Padding For Kids Bedrooms? A thin padding works best for kids rooms, like a 1/4" or 3/8" thickness, 6-pound density Rebond type pad. This keeps the cost down and it will help the carpet survive under demanding situations. There is no need to spend a lot of money on padding for kids bedrooms. Best Carpet Styles and Colors For Kids Bedrooms? A earth-toned, multi-colored plush or textured-plush style is most commonly used in kids bedrooms. It vacuums easily and easily hides dirt and stains. Avoid light colors and single colored carpets. A darker color or a multi-colored carpet will yield the best results and help hide spots and stains. The key to having your carpet last as long as possible is to choose the right grade for your specific application and level of foot traffic and then to care and maintain it according to the Carpet Manufacturer's Warranty guidelines. Cost: Ranges from $3.00 - $5.50 per square yard. Pad Thickness: 3/8", 7/16", 1/2". Cost: Ranges from $3.50 - $6.50 per square yard. Pad Thickness: 3/8", 7/16", 1/2"
Q. Should you CLEAN or REPLACE your Old Carpet? Visit Alan's Carpet Care Guide Learn how to make your new carpet last YEARS longer. and What Grade of Carpet You should consider buying for your home. It's getting harder everyday to find an honest and reputable Carpet Dealer! 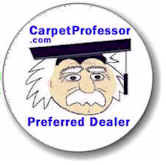 That's why I put together my own special hand-picked list of Carpet Dealers who are locally owned, give free estimates, have fair prices, have knowledgeable salespeople, provide honest measuring and have qualified installers. See who I recommend near you! Carpet cost, How much does new carpet cost, lowest Carpet prices, Best price for new carpet, Best carpet prices, Best carpet deals, Where to buy new carpet. How much does new carpet cost? Don't be a victim of a Carpet Scam. *"I do not provide legal advice on any level. I am not an attorney. If you want or need professional legal advice you should seek the advice from an attorney."